Orienteering is a challenging outdoor adventure sport enjoyed by people of all ages, abilities and backgrounds. The aim is to navigate a sequence of control points marked on a map. Test your mind and body as you decide the best route to complete the course in the quickest time. There are numerous races every week, mostly in countryside (forests, heathland etc.) within an hours drive of London, and occasionally in the parks and streets of the capital. Each event has a range of courses between 1km and 10km, with varying levels of navigation technical difficulty. Around 150-350 runners participate in any one event. The British Orienteering website has a good newcomers guide. It does not matter how young, old or fit you are, as you can run, walk or jog at your own pace. 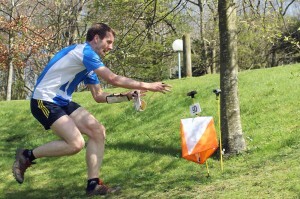 If you enjoy running you will find orienteering a challenge: see how you fare against the best orienteers. If on the other hand you fancy a quiet walk in the countryside, choose a course of the desired length, and set off. List of control numbers and location descriptions. These are usually printed on the map, but are also loose and can be put in a transparent holder that you strap to your forearm. Cash. The events cost around £5-£15 to enter, depending on the size of the event. It is cheaper for juniors and British Orienteering/LOK members. Transport. Most events are in the countryside and inaccessible by public transport. Contact the club chairman about sharing a ride if you do not have a car. Click here to download a short PDF guide to knowing your correct age category (required for national, regional and other events).